On Monday December 9, the US government sold its remaining stake in General Motors Co. (GM). While the automaker is doing well financially, it is also making progress in terms of sustainability. The U.S. government was repaid the $39.5 billion it lent to GM as part of the 2008-2009 auto bailout, which forced GM and its Chevrolet division into a government-backed bankruptcy. According to the CAR study, in addition to saving 2.6 million jobs in 2009, the bailout preserved $284.4 billion in personal income between 2009 and 2010. In less than five years GM and other American automakers have become profitable and they have added more than 372,000 new jobs. However, the bailout was not only an economic success, it bought GM time to improve its environmentally destructive trajectory. One of these improvements involves a new labeling system that Chevrolet is now posting on its vehicles. The label summarize fuel-efficiency technologies and environmental progress. This first-of-its-kind EcologicTM Label lets consumers see some of the environmental features of the vehicle relating to manufacturing, driving and recycling. The claims on these labels are independently audited by Two Tomorrows, a third-party sustainability agency. GM is now moving forward with the production of vehicles that have better fuel efficiency and lower emissions. GM has also adopted manufacturing processes that have a smaller footprint. GM is at the forefront of the dawn of a more responsible American auto industry. According to the EPA, from 2007 to 2012, U.S. fuel economy values have increased by 16 percent. Between 2011 and 2012 there was a 1.4 mile per gallon (mpg) increase in fuel efficiency for the 2012 lineup of American cars and trucks. In 2012 the average fuel economy among American automakers increased to 23.8 mpg. This is among the largest annual improvements since EPA began reporting on fuel economy. The average fuel economy of new vehicles sold in August 2013 reached an all-time high of 24.9 miles per gallon. That’s up almost five miles per gallon since researchers began tracking the number in October, 2007. Both projected and actual US fuel economy figures from the EPA show that there has been a reversal of the long-term trend towards worsening fuel efficiency. There was a rapid increase in average fuel consumption from 1975 through 1981 and a slower increase with an efficiency peak in 1987. This was followed by a gradual decrease in fuel efficiency until 2004 when the average fuel economy numbers for American cars was just 19.3 mpg. Since then there has been a steady increase in fuel economy ratings. GM is leading domestic automakers in making large gains in fuel efficiency. GM now has 20 models that get 30 mpg hwy or better, including the car with the best highway mileage of any gas engine in America, the 42 mpg-hwy Chevrolet Cruze Eco. GM has improved its fuel economy ratings between 2009 and 2012. According to EPA figures, in 2009 GM vehicles averaged only 19.9 mpg as of 2012 the average mpg for GM vehicles rose to 21.4 mpg. Part of the reason GM is generating better efficiency numbers is due to the fact that they are manufacturing less big vehicles and more smaller fuel efficient cars including hybrids and fully electric vehicles. The overarching context for these improvements is the Obama administration’s fuel efficiency standards which will require that automakers double their economy ratings by 2025. The Corporate Average Fuel Economy or CAFE standards will raise industry-wide fuel economy to 54.5 mpg by 2025, (it should be noted that CAFE standards are not the same as mpg ratings). As of 2012, GM got a CAFE fuel economy rating of 32.9 MPG for domestic passenger cars and 23.5 for light trucks. According to the EPA, 2012 cars and trucks continued to decrease their carbon pollution. The research shows that vehicle emissions as measured by what is known as the Eco Driving Index has also improved. EPA data indicates that in 2009 the average CO2 vehicle emissions were 8 percent lower than in 2004 which had a rating of 461 grams per mile (g/mi). In 2012, EPA figures show that American auto makers reduced their CO2 emissions to 374 (g/mi). From 2007 to 2012, EPA estimates that CO2 emissions have decreased by 13 percent. In 2009 GM had an average carbon emissions rating of 447 (g/mi). In 2012 GM saw its CO2 emissions decline to 418 (g/mi). GM is also a global biofuel leader including ethanol which in comparison to gas, emits 21 percent less CO2. GM is also decreasing its waste through its landfill-free program. As reported by GM, the company boasts an industry-leading total of 105 facilities that recycle, reuse or convert to energy all waste from daily operations. GM is recycling and reusing 90 percent of its manufacturing waste worldwide and in the process the company generates about $1 billion in revenue annually. GM has reduced its total waste 25 kilograms, or 55 pounds, per vehicle since 2010. GM sees electrically driven vehicles as the best long-term solution for energy-efficient transportation. GM is the leader in domestically produced hybrid and electric vehicle components. GM produces their own batteries in the largest and most technologically advanced battery development facility in the U.S. They are the first major U.S. automaker to design and manufacture electric motors for their hybrid and electric vehicles. GM is also a leader in extended range electric with vehicles like the Chevrolet Volt and Opel Ampera. The Chevrolet Volt has an estimated 94 MPGe electric, and when using the gas engine it generates ratings of 35 mpg city, and 40 mpg hwy. The range for the Volt is 35 miles of electric driving. Once the electric charge is depleted, a gas-powered engine generator provides an additional 340 miles of range. GM’s hybrid Silverado pickup has an EPA estimated 20 mpg city and 23 mpg hwy. The Buick LaCrosse and Regal have what is known as eAssist technology which get an EPA estimated 25 mpg 25 city and 36 hwy. 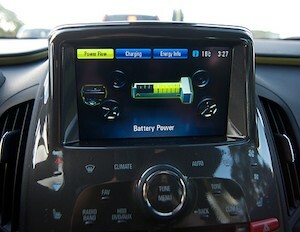 The 2013 Chevrolet Malibu Eco also uses eAssist and gets an EPA estimated 25 mpg 25 city and 37 hwy. The new eAssist technology is an electrification solution that enhances fuel efficiency up to 25 percent when paired with existing engines. The electric motor recaptures energy and shuts off fuel during braking. To further increase efficiency, it stops and restarts the engine in stop-and-go city driving. An onboard lithium-ion battery provides an electric boost in certain conditions to improve efficiency. GM engineers are at the forefront of hydrogen fuel cell technology which have no CO2 emissions. They have been working on FCVs for more than 16 years and they are the country’s leading innovators in this technology of the future. Fuel cells have 2.3 times the efficiency of conventional powertrains and take around three minutes to refuel. To date GM fuel cell vehicles (FCV) have driven more than 3 million miles as part of their test fleet of 100 Chevrolet Equinox SUVs undergoing real-world testing by families and commercial users. GM is expanding a research project with the U.S. Army to accelerate the development of hydrogen fuel cells. GM is working on hydrogen fuel cell powered vehicles with the military’s Tank Automotive Research, Development and Engineering Center (TARDEC). In 2013, GM teamed up with Honda to bring affordable hydrogen-powered vehicles onto the market by the end of the decade. GM hopes to have as many as one million affordable FCVs by 2020. In 2012, GM invested more than $7.3 billion in the research and development of “next-generation” technologies. During 2011 and 2012 GM received more clean energy patents than any other organization, according to the Clean Energy Patent Growth Index of US patents. The company continues to improve fuel economy and decrease mobile emissions through advanced engine and transmission technology, next-generation batteries and electric motors, and power electronics. They are also working on vehicles with better aerodynamics as well as reduced weight and mass which makes them up to 15 percent lighter than comparable vehicles on the road today. In 2012 General Motors was among several recipients that received $54 million in Energy Department grants aimed at improving the energy efficiency of advanced manufacturing technologies. GM received $2.7 million to develop an integrated die-casting process for a thin-walled magnesium application used to manufacture car doors. The manufacturing process is expected to cut energy use by 50 percent. The reduced weight in the doors also will improve fuel economy and reduce carbon emissions. GM’s lineup of gasoline-powered vehicles are increasingly efficient due technological innovations including direct fuel injection, active fuel management, variable valve timing and turbocharging. They are also focusing on tire construction to make their vehicles more efficient. In 2013 GM began using a new refrigerant that has a global warming potential (GWP) that is a tiny fraction of previous refrigerants. Developed in 2010 GM was the first company to introduce a climate-friendly refrigerant to replace the super greenhouse gas used in auto air conditioning. The new refrigerant, called an HFO, has a global warming potential of just 4 compared to over 1,400 for HFC-134a. The new refrigerant remains in the atmosphere for just 11 days, according to Honeywell, its producer. Honeywell calculates that the low GWP and the short lifetime of its HFO represents a 99.7 percent improvement over HFC-134a. GM is also a biofuel leader and according to their own reports, they are developing technologies that turn agricultural and municipal solid waste into ethanol. In 2012 General Motors installed an 8.15 MW solar array on the rooftop of one of its Opel plants in Germany. The array at Rüsselsheim is one of the largest solar installations in Europe with an area equivalent to 32 soccer fields. It generates about 7.3 million kWh per year of energy. This represents a CO2 reduction of about 3,150 tons a year, equal to the amount of carbon isolated annually. The latest installation, together with GM’s other solar arrays in Kaiserslautern, Germany, and Zaragoza, Spain, will allow the company to produce 19.1 million kWh of electricity a year which reduces CO2 emissions by 8,200 tons annually. According to their 2013 Sustainability Report, by 2015 GM will have a solar output of 60 MW by 2015 and the company plans to have a renewable energy output of 125 MW by 2020. GM also has a few LEED-certified buildings including an engine plant in southern Brazil, equipped with numerous sustainability features including solar energy and water recycling systems. Another innovative program harvests energy from test benches its Powertrain Engineering Center in Turin, Italy. The amount of energy harvested is equal to 300,000 kWh of energy. GM’s manufacturing technologies decrease the use of energy, resources and materials. As reviewed in their 2013 Sustainability Report, GM is committed to reducing energy and carbon intensity in their global manufacturing operations. The EPA has recognized GM with its Energy Star partner of the year for Sustained Excellence award and the company has a total of 54 facilities that meet the Energy Star Challenge for industry. According to Green Car Congress, in 2012, the company realized energy-efficiency improvements of 2 percent over 2011, and similar decrements in carbon emissions intensity. GM also reduced the amount of energy required to build each vehicle by 7 percent since 2010. In 2012, GM’s energy intensity per vehicle manufactured was 2.30 MWh per vehicle, down from 2.47 MWh/vehicle in 2010. The 2020 target is 1.97 MWh/vehicle. GM’s carbon intensity per vehicle in 2012 was 0.88 metric tons CO2e, which is down from 0.92 in 2010. The latest data shows that average total energy usage for GM’s international operations is 1.14 MWh per vehicle, less than half the industry average of 2.37 MWh per vehicle. GM’s energy management and renewable energy programs have helped reduce carbon intensity of manufacturing by 5.3 percent since 2010 and they are targeting a 20 percent reduction by 2020. The 2020 target is 0.75 tonnes/vehicle. According to GM’s 2012 Sustainability Report, by 2017 the company expects to double models with a rating of 40 mpg (highway) or better, further reduce the energy used in production as well as diminish the environmental impacts from its buildings and vehicle operations. By 2017, GM has pledged to have 500,000 vehicles on the road in the US with some form of electrification and to reduce the average CO2 tailpipe emissions of its US fleet by 15 percent. GM subsidiary Opel estimates will reduce the average carbon tailpipe emissions by 27 percent by 2020. GM will also continue to reduce vehicle mass and aggressively invest in advanced materials, such as high-strength steel, carbon fiber and aluminum as well as an industry-first lightweight aluminum welding technology. Other ongoing efficiency oriented innovation includes downsizing, turbocharging, direct injection, variable valve timing and cylinder deactivation. Five years ago GM was on the brink of closing its doors forever, now they are making more fuel efficient cars with less emissions. They have also reduced the impacts of their manufacturing processes, minimized waste and decreased their use of energy and other materials. As suggested by GM’s commitments for the future, this is only the beginning of a sustainability journey that will help lead America into the new automotive reality. ?? *State of the art Innovative concept Top system Higher efficient percent. ?Have similar system of the Aeolipile Heron Steam device from Alexandria 10-70 AD. -New Form-Function Motor-Engine Device. Next Step, Epic Design Change, Broken-Seal Revelation. -Desirable Power-Plant Innovation. -This innovative concept consists of hull and core where are held all 8 bteps of the work-flow which make the concept functional. The core has several gears and turbines which are responsible for these 8 steps (5 of them are dedicated to the turbo stages). The first step is fuel compression, followed by 2 cold turbo levels. The fourth step is where the fuel starts burning – combustion stage, which creates thrust for the next, 5th step – thrust step, which provides power to the planetary gears and turbines and moves the system. This step is followed by two hot turbo steps and the circle is enclosed by the final 8th step – bigger turbine. All this motion in a retrodynamic circumstance effect, wich is plus higher RPM speed by self motion. The Reaction at front of the action.
? ?-With Retrodynamic Dextrogiro vs Levogiro Phenomenon Effect. / Rotor-RPM VS InFlow / front to front; “Collision-Interaction Type” – inflow vs blades-gear-move. Technical unique dynamic innovative motion mode. [Retrodynamic Reaction = When the inflow have more velocity the rotor have more RPM Acceleration, with high (XY Position) Momentum] Which the internal flow (and rotor) duplicate its speed, when activated being in a rotor (and inflow) with [inverse] opposite Turns. The Reaction at front of the action. A very strong Novel torque power concept.
? ?-Non waste parasitic looses for; friction, cooling, lubrication & combustion. -Shape-Mass + Rotary-Motion = Inertia-Dynamic / Form-Function Wide [Flat] Cylindrical shape + positive dynamic rotary mass = continue Inertia positive tendency motion. Kinetic Rotating Mass.
? ?-Combustion 2Two continue circular [Rockets] flames. [ying yang] opposite one to the other. – With 2TWO very long distance INFLOW [inside propulsion] CONDUITS. -4 TURBOS Rotary Total Thrust-Power Regeneration Power System. -Mechanical direct 2two [Small] Planetary Gears at polar position. -Like the Ying Yang Symbol/Concept. -Wide out the Rotor circumference were have much more lever [HIGH Torque] POWER THRUST. -No blade erosion by sand & very low heat target signature profile. -3 points of power thrust; 1-flow way, 2-gear, 3-turbine. *Patent; Dic. 1991 IMPI Mexico #197187 All Rights Reserved. Carlos Barrera. *State of the art Innovative concept Top system Higher efficient percent. *Power by bar, for Air-Planes, Sea-Boats, Land-Transport & Dynamic Power-Plant Generation. ?-Have similar system of the Aeolipile Heron Steam device from Alexandria 10-70 AD. -New Form-Function Motor-Engine Device. Next Step, Epic Design Change, Broken-Seal Revelation. -Desirable Power-Plant Innovation.